Not to be confused with either the 1989 sci-fi / horror movie starring Peter Weller or the 2014 Russian drama that was nominated for Best Foreign Film at this year’s Academy Awards, 2012’s Leviathan is a documentary directed by Lucien Castaing-Taylor and Véréna Paravel, both of whom work at Harvard University’s Sensory Ethnography Lab, a facility that instructs students on how media can be used to enhance the study of mankind and its various cultures. An experimental movie, Leviathan was shot aboard a fishing vessel out of New Bedford, Massachusetts with the help of a few dozen GoPro cameras (which, because they’re both small and waterproof, could be placed anywhere on the ship), allowing the filmmakers to observe the crew as they performed their everyday tasks while, at the same time, focusing on the natural beauty of the sea. What makes Leviathan so unusual is that it’s not a traditional documentary; there’s no narrator to guide us, no logical flow to the images its presents. What we get instead are a series of sequences, pieced together in random order, featuring only natural sound. The movie opens with an extended scene on the deck of the ship, where we watch a crewman working on the apparatus that lifts the nets out of the water. We have no idea what he’s doing, or why he needs to do it (the camera is obviously strapped to the jacket of a co-worker, who shouts instructions from time to time that are indecipherable). From there, we find ourselves sloshing around on a table, mixed in with the most recent haul of fish (some of which are downright ugly). There were moments in Leviathan when I couldn’t figure out what the camera was attached to; in one scene, a seagull, in extreme close-up, is attempting to make its way over a short wall, and failing to do so. Was the GoPro device that captured this moment somehow on the bird itself, or had the poor creature gotten tangled up in one of the ship’s riggings, inadvertently carrying the camera along with it after it broke free? This question, like many others, is never answered. 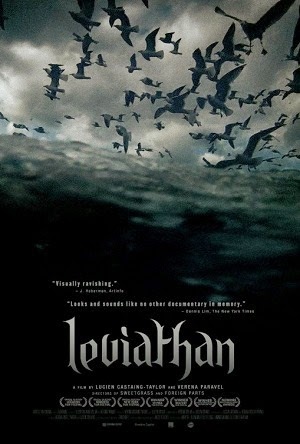 With images ranging from the beautiful to the mundane (one breathtaking sequence, in which the camera, clinging to a net, bobs up and down in the water as a flock of sea birds tags along is immediately followed by a scene where we watch a member of the crew taking a shower), Leviathan is a truly unique, yet altogether fascinating experience, and I can honestly say I’ve never seen anything like it before.